I recently finished this design for a client who wanted a slightly Moroccan feel to her new baby girls nursery. We were incorporating a daybed into the room as well to serve as a guest bed. This was fun because it allowed for another place to put fun colorful pillows. We all know I love pillows! I also love white bedding so that the pillows can be the spotlight against the neutral backdrop. 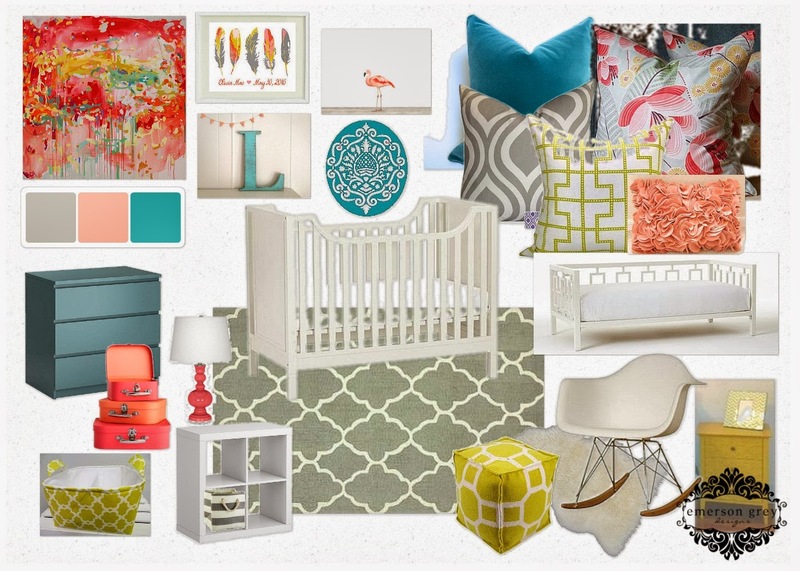 An accent wall would really take the show in this room made up of a beautiful stencil that is shown above the crib in the design board. A gallery wall featuring an abstract from the talented Michelle Armas, a colorful wooden initial and a few other prints will add a pop of color on the rest of the walls that will be kept very light, possibly white. I am excited to see this room completed as I know this client is very talented and will put her own fun spin on my design.